Each year Pool & Spa News, one of the industry’s most trusted and forward thinking news outlets dedicated to thought-provoking and innovative content on cutting-edge design and trends in their field, announces their cream of the crop in regards to pool and spa builders. Aqua Pool & Patio is happy to announce their 3rd appearance on this incredible list showcasing the best and brightest pool builders working today. As a repeat honoree, Aqua Pool earned the eighteenth slot out of the top fifty companies in the nation. Judging is based on a variety of factors from staffing practices, networking capabilities, community services, web presence, and residential construction revenues. Amongst the represented companies, the top fifty earned a boasting $742 million dollars in total revenue in 2013 with regions topping the list like California, Arizona, Texas, and Florida. Aqua Pool & Patio also received the special nomination and #1 slot on the charts for the Most Involved Company. This means that Aqua Pool ranks highest amongst industry and non-industry associations concerned with issues such as safety, health, and green design. A last recognition bestowed on Aqua Pool and Patio is MVP of Top Builders. Gregg Pruitt, Vice President of Aqua Pool & Patio Inc.'s Construction department was awarded the honor. 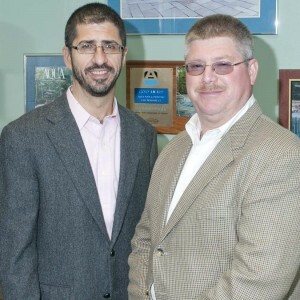 Pruitt has been with Aqua Pool for over thirty years and assists Vice President Michael Giannamore by running all day-to-day operations and construction of all pools. With the responsibility of monitoring quality, Pruitt’s contribution to Aqua Pool & Patio’s upstanding craftsmanship is a direct reflection of his persistence, determination, and dedication to building the best the industry has to offer.